Seven officials from the Ministry of Legal Affairs and Supreme and Magistrate courts traveled to San Francisco, California where they met with judges, commissioners, mediators, and attorneys at the San Francisco County Superior Court to learn about San Francisco’s innovative unified family court system, which provides a coordinated approach to family, juvenile, and dependency matters and streamlined interaction with collaborative courts, including drug and mental health courts. During the INL-sponsored study tour, the Bahamian delegation met with the Judicial Council of California, the main policymaking body for all California courts; the San Francisco City Attorney’s Office, which represents the San Francisco city and county in legal proceedings and acts as the city’s general counsel; the San Francisco Public Defender’s Office, which provides legal services to over 25,000 indigent criminal defendants each year; and the Bar Association of San Francisco, which runs a justice and diversity center that provides holistic pro bono legal services for low income residents of San Francisco. The justice sector officials also met with the Supervisor of the San Francisco chapter of the California Official Court Reporters Association to learn about San Francisco’s transition to digital transcription in misdemeanor cases, which ultimately allowed financial and human resources to be dedicated to juvenile, domestic violence, and other criminal cases. In addition, the group was introduced to the Superior Court’s ACCESS Center, a walk-in court office that provides self-help resources for family matters and some civil cases for self-represented litigants seeking legal information and resources. During meetings, the San Francisco practitioners not only shared best practices with the visiting delegation, but also discussed ongoing challenges in implementing new techniques and procedures, providing the Bahamian government a holistic look at the unified family court system and the use of digital transcription to inform ongoing legal reform in The Bahamas. The study tour was part of ongoing efforts under CBSI to reform and strengthen justice sectors throughout the Caribbean, including juvenile justice systems. 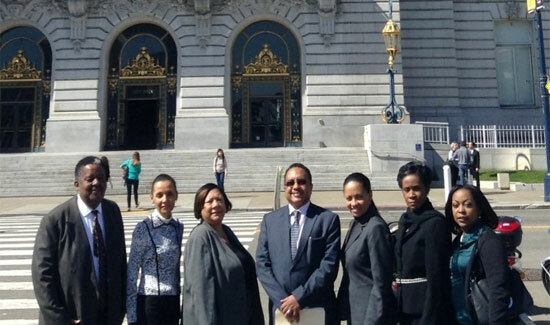 Caption: Justice sector exchange participants in front of San Francisco’s City Hall.